As we were on holiday in Camber Sands, and my self-imposed Sunday lunch was lifted, I just had to book somewhere to review. After some research I decided on The Dune Bar. Easy to reserve, I booked a month or so ahead. Sunday lunch starts at 1230. We travelled over the stoney beach (with a pram!) to the sandy part and The Dune Bar. A (pay and display) car park is next door if you are not quite so foolhardy as us! Styled with a contemporay beach-theme – the table was laid out with beach photo place mats :-) It wasn’t overly smart, but a nice looking pub / restaurant off the beach. A pint of Sussex long ale for me, and a rose wine for Claire. 1980’s type of starters available here, Claire asked for the Prawn Cocktail, I gave the Boar Pate a go. 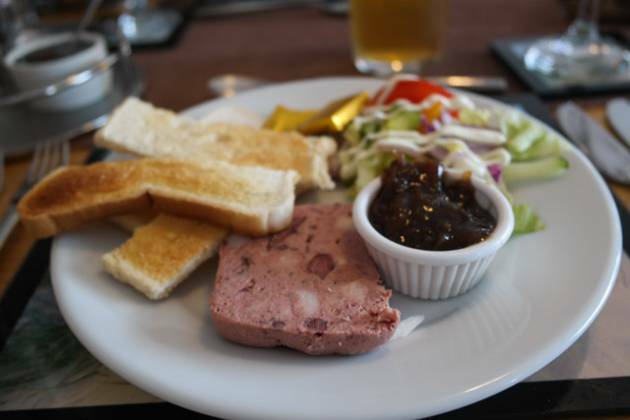 The starters were served quite quickly; I was quite pleased with mine, the pate was nice, and I had quite a bit of toast to spread it on. 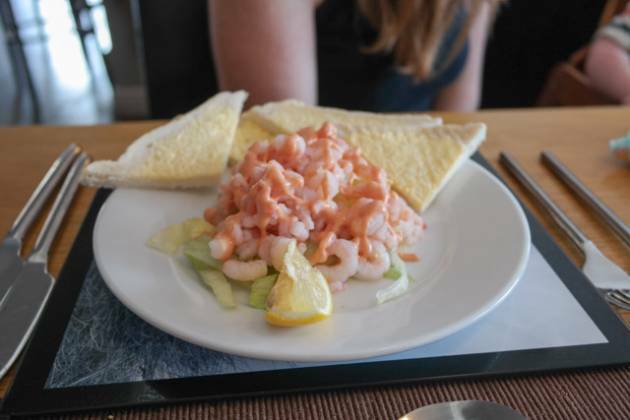 The bread with Claire’s prawn cocktail was a bit stale, and presentation could have definitely been better. The actual starter was ok though. We ordered the Children’s Roast Lamb for JW, Claire asked for Roast Chicken and I asked for the (adults!) 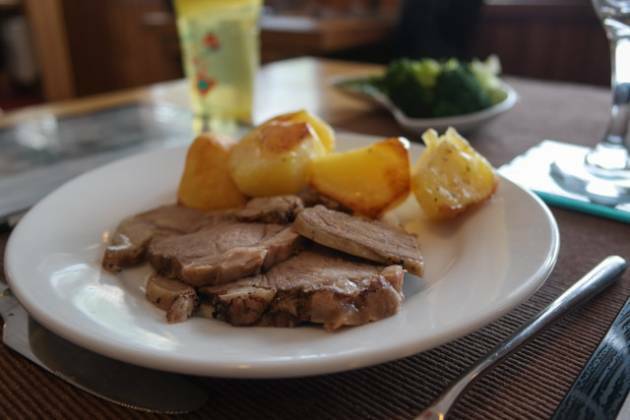 Roast Lamb. As JW was off gluten for a while, we asked for his to come without gravy. The mains were served with a side dish of broccoli and mange tout. Claire and I each had 5 roast potatoes, along with a yorkshire pudding. Claire also had some stuffing too. Her chicken was a breast with bacon wrapped around and then sliced. I had three large, thick slices of lamb, with JW’s being a smaller serving. We also ordered some extra peas, as JW didn’t want any of the vegetables. Whilst the presentation was “ok”, it tasted quite nice. 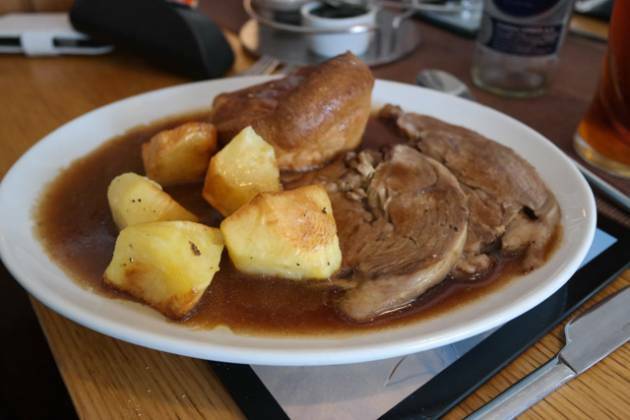 The gravy was nice and rich, the lamb tender – Claire really enjoyed her chicken (very moist). The roast potatoes were fairly crispy on the outside, the quantity made up for the quality. The vegetables were cooked to our liking, al dente. We would have preferred more of a selection, but the roast was so large as it was (and I wouldn’t want to sacrifice any of the meat!). I was pleased that the high chair for JW was clean and in good repair. Unfortunately, they didn’t have any baby changing facilities so we had to use the toilets by the beach after lunch. It was good that they offered a children’s menu – it meant JW could have a Sunday roast with us. 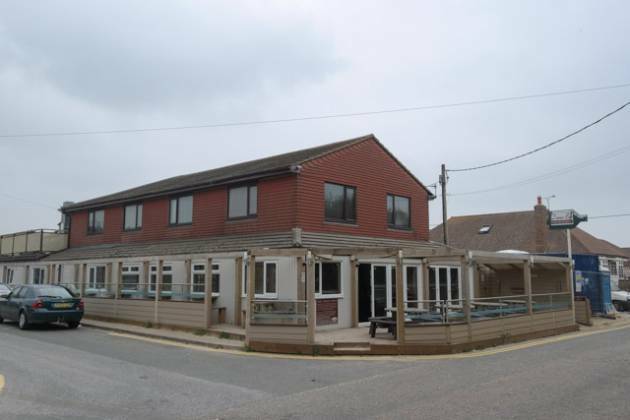 A nice venue very close to Camber Sands beach – the service was ok, we were well looked after. The prawn cocktail starter was a bit of a let down, although the boar pate was nice. 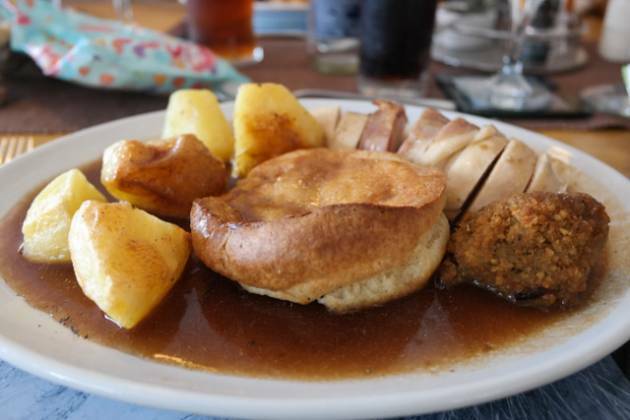 The actual Sunday lunch was quite good, especially the portion – definitely good value for money. Facilities for children were ok, as long as you don’t need baby changing facilities. Overall, a decent venue for families and beach visitors to visit. The Dunes Bar & Restaurant score a respectable 3.5 / 5 stars.